It's Olena here today to share with you a Sweet Cupcake Shop card! 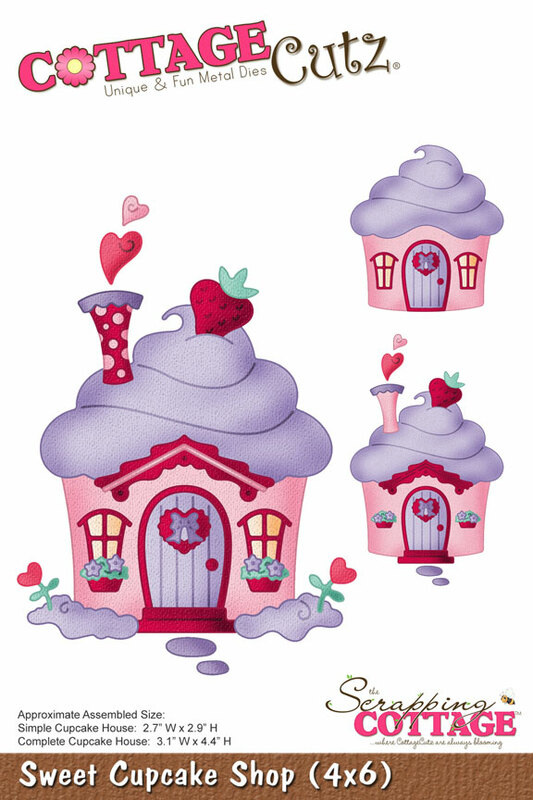 I made this card using the Super CUTE CottageCutz dies- Sweet Cupcake Shop dies (4x6) from NEW 2013 Sweet Little Things Collection. I cut out all the pieces with different colors of cardstock and sponge them with inks. Using Spellbinder Classic Circle die and Embossing Dots Folder, I created a yellow circle frame. For base card I used red cardstock 5" x 5". I added all pieces and die cuts to card front as shown in picture above. I, also, added Fance punch cuts in right and left side of this house. I think, it will be perfect add to this house. I decorated card with blue plastic pearls, yellow rhinestones and Stickles. iiii, this is so sweet like a candy. Love it. OMGosh, Olena....THIS IS SO SWEET! Beautiful card with beautiful colors! This is so cute Olena! What a great job you did coloring and composing this project. How fun with the little polka dot trim on the image Olena. This is just darling. OMgosh Olena your card is DARLING!!!!! I LOVE LOVE LOVE your cupcake!You did a beautiful job with the sponging and I LOVE all the little details you added. Beautiful job & SUPER Cute!!! !